This form is vital for all companies to assess a team member’s job knowledge, work quality, dependency, cooperation and punctuality. It also informs about their creativity, communication skills, attendance, technical skills and attitude in the workplace. This form can be used to digitally complete employee assessments with no paperwork. This form is used to evaluate and provide feedback on employee job performance. 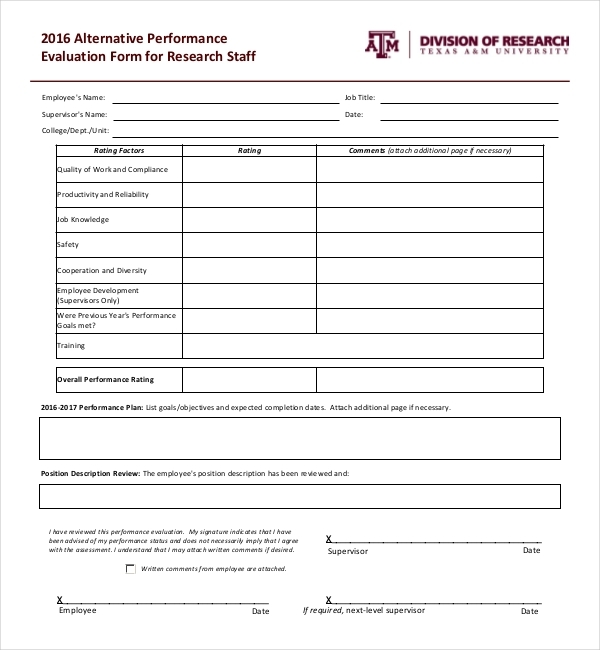 This form provides option to include steps to improve or redirect activities as required. It gives a basis for pay increases and promotions and encourages professional development. It is important to assist staff members refine their skills and performance. This form is used to evaluate the team member’s job knowledge, technical knowledge, improvements, work quality and quantity. It is also used to review their additional responsibilities, adaptability, judgment and punctuality. This form is not stored in a filing cabinet. It is used to reward or recognize for a job well done. The purpose of this form is to show commitment to organizational excellence with the District-wide Strategic Goals and Instructional Objectives. 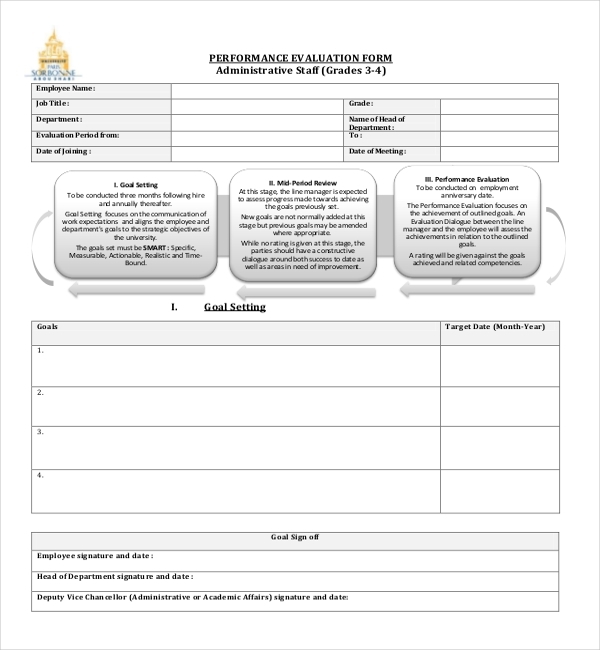 This form is designed to help with refinement of individual performance, thereby enhancing institutional effectiveness. This form is used to recognize achievements, establish training needs and include suggested areas for refinement. This form evaluates whether the employee reports to work on time, use the allotted time constructively and meet deadlines. It analyzes whether they work under pressure with limited or no supervision. It, further, reviews their job knowledge, willingness and professionalism. This form evaluates their communication skills, personality, appearance, habits and character. This report is helpful for both the supervisor and employee to analyze whether the expectations of performance are being met and how well. This report is helpful to analyze where the performance was strong and weak; what factors and circumstances where involved; and ways to improve the performance in future. There are three stages to set and review goals in this form. First one is to set smart and strategic goal. In second stage, both parties discuss about success till date without rating; add new goals or amend previous goals. In third stage, rating is given against achieved goals and related competencies. In this form, the supervisor will provide overall rating, establish performance goals and include any applicable changes based on present duties or upcoming duties. A copy of this form is given to the employee to attach a response or comment. It is an important part of the performance appraisal process. This form is used by the supervisor to evaluate whether the employee is viewed as a leader and problem solver/notable and reliable contributor/someone with unrecognized potential or as a risk for the organization. It is used to evaluate whether the employee is willing to learn and improve their skills, abilities and performance. This form is used to evaluate whether the employee met work product standards, milestone and completion due dates. It also informs whether they submitted accurate and timely deliveries and responded to customer needs. This form, further, states whether they conducted business in professional manner and provided effective written and verbal communication. 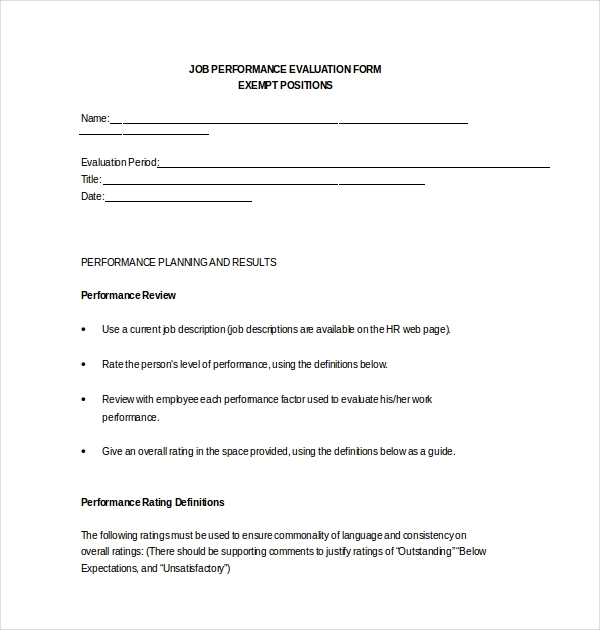 Employee’s performance can be checked using this form-template. 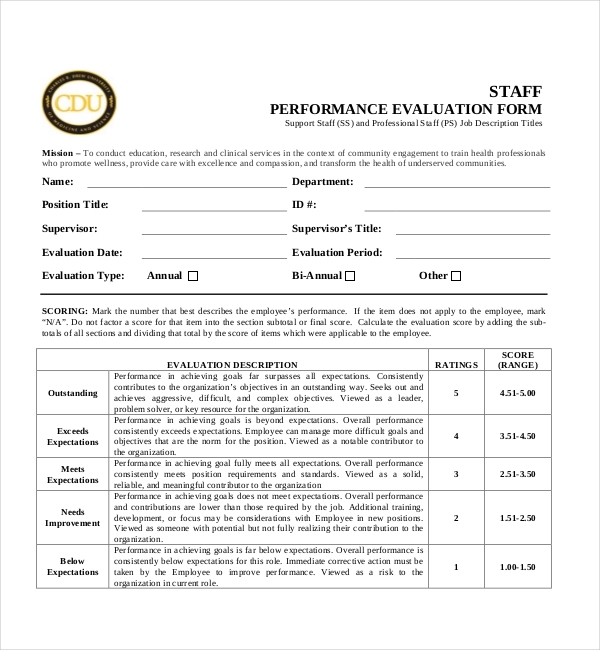 While they are submitting the work, the supervisor fills out this form to give an evaluation of the employee’s performance. This form can help the employee enhance and improve by reviewing supervisor’s feedback and give better performance in future. This form can be customized or used directly according to their requirement. 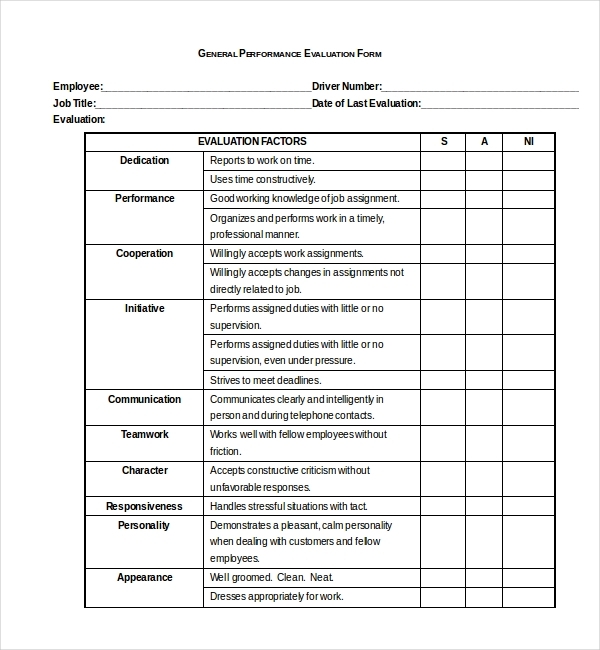 This evaluation form can guide employees by reading feedback for their work. The employees can add overall response and comments, while the supervisor adds the extent of the objectives met. This form is used by the supervisor to give constructive feedback to the employees who are presenting their work. The evaluation results should be used to improve the effectiveness of the employee. This form can be used by the employee to add comments. This form is used by the supervisor to explain whether the employee created a setting for positive working experience and the way they did. Further, they have to explain the way the employee encouraged participation. These forms are for any supervisor who likes to give feedback for their employee’s work even the supervisors who provide online opportunities to job seekers. It helps determine goals and objectives of a work which will help determine which methods to use. The employee might learn the process of completing work faster in future using a technique suggested by the supervisor. Employees might learn to create better understanding about their job and organization and demonstrate confidence in the work place. They might also learn to organize the work in a coherent manner. They might develop confidence and experience in their performance by becoming promoted. This form is helpful in building greater the mutual understanding regarding expected job performance between an employee and supervisor. It is better when employees understand what is expected as will deliver acceptable performance as soon as he/she is aware of the standards. Hence, it will give greater chance to the employee to perform the work in an acceptable way. Communicating the standards and expectations in writing and permitting the employee the opportunity to clarify or discuss the standards is important. Standards must be attainable, reasonable and measurable. Using this form, the supervisor should give the employee the assistance vital for his or her success on the work provided. They should also cautiously lay the groundwork for job accountability and give much of the documentation vital should an employee’s inability to complete work necessitate disciplinary action. The purpose of evaluating the employee’s performance is to know their strengths and find areas of required refinement. The supervisor has to explain whether the employee is well organized, well prepared, speak clearly and has understanding of the work. The supervisor can guide and help employees using this form in preparing for their career enhancement by challenging the individual, giving realistic information, listening and asking good questions. Find the needs most significant to the agency, supervisor, and employee in terms of overall job performance. There was a time when supervisors had to buy the forms for the purpose of performance evaluation. But, these forms are accessible for any supervisor online. They can click on the form in their preferred Word and PDF formats. Some supervisors doubt authenticities of online forms; but, these forms are completely error free. They can download and print them within seconds. We have made the forms available for you in different versions in higher and lower ones as your preference. In case, a supervisor prefers extra customization, we can help them. No need to doubt, simply download these forms successfully from our website. 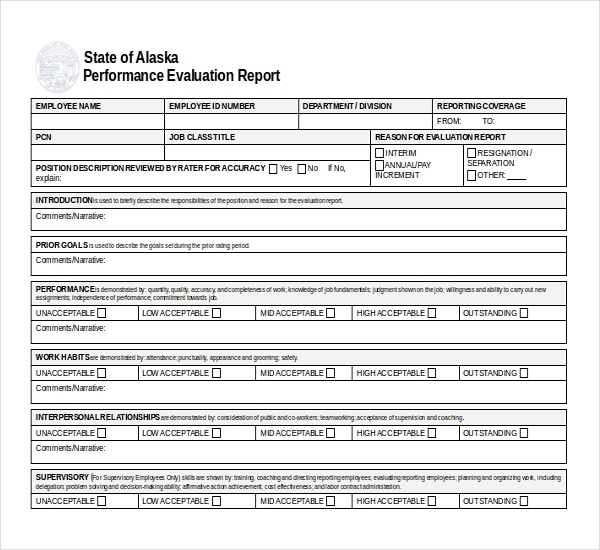 These forms can be downloaded and customized online for the performance evaluation. It is essential that the supervisor focus on every detail so that they can avoid leaving out anything significant. 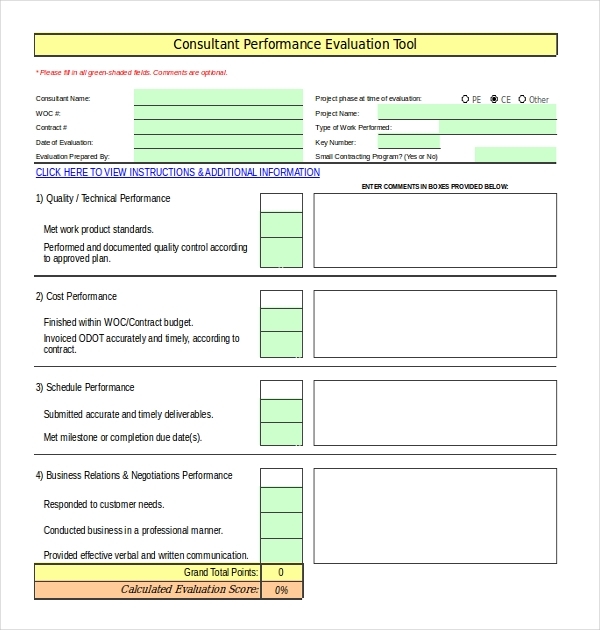 The performance evaluation form helps employers to gain feedback and confidence from their supervisors. It is not the place to point out issues for first time with job performance or behaviors, except as it may occur as part of creating goals. In this process, employees might become promoted and learn to take more responsibility for learning.